The Bugatti Veyron is currently the fastest, most powerful, and most expensive street-legal full production car in the world with a proven top speed of 253 mph. 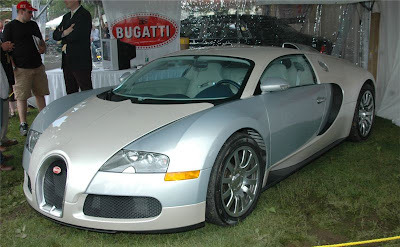 Though several faster or more expensive vehicles have been produced on a limited basis the Bugatti reached full production in September 2005. The car is built by Volkswagen subsidiary Bugatti Automobiles in its Alsace, France factory and is sold under the legendary Italian/French Bugatti marque. It is named after French racing driver Pierre Veyron, who won the 24 hours of Le Mans in 1939 while racing for the original Bugatti firm. The Veyron features a W16 engine—16 cylinders in 4 banks of 4 cylinders, or the equivalent of two narrow-angle V8 engines mated in a "W" configuration. Each cylinder has 4 valves, for a total of 64, but the narrow V8 configuration allows two camshafts to drive two banks of cylinders so only 4 camshafts are needed. The engine is fed by four turbochargers, and it displaces 8.0 L with a square 86 by 86 mm bore and stroke. Putting this power to the ground is a dual-clutch DSG computer-controlled manual transmission with 7 gear ratios via shifter paddles behind the steering wheel boasting an 8 millisecond shift time. The Veyron can be driven by full automatic transmission. The Veyron also features full-time all-wheel drive based on the Haldex system. It uses special Michelin run-flat tires designed specifically for the Veyron to accommodate the vehicle's top speed. According to Volkswagen, the final production Veyron engine produces between 1020 and 1040 metric horsepower, so the car will be advertised as producing "1001 horsepower" in both the US and European markets, despite the fact that the actual amount of horsepower produced is 986 - making it the second most powerful road production car - second only to the Koenigsegg CCXR, which it is claimed develops 1004bhp, although further testing in the Koenigsegg laboratories has proven it can hit 1064bhp. Top speed was initially promised to be 252 mph, but test versions were unstable at that speed, forcing a redesign of the aerodynamics. In May 2005, a prototype Veyron tested at a Volkswagen track near Wolfsburg, Germany and recorded an electronically limited top speed of 249 mph. In October, 2005, Car and Driver magazine's editor Csaba Csere test drove the final production version of the Veyron for the November 2005 issue. This test, at Volkswagen's Ehra-Lessien test track, reached a top speed of 253.2 mph. The top speed was verified once again by James May on Top Gear, again at Volkswagen's private test track. When getting close to the top speed during the test he said that "the tires will only last for about fifteen minutes, but it's OK because the fuel runs out in twelve." He also gave an indication of the power requirements, at 155 mph the Veyron was using approximately 270 BHP (201 kW), but to get to its rated 253 mph top speed required far more from the engine. The power required to overcome aerodynamic friction is proportional to the cube of the speed. Therefore, to go twice the speed, you need eight times the power. The Veyron is the quickest production car to reach 62 mph with an estimated time of 2.5 seconds. It reaches 60 mph in approximately 2.46 seconds. It also reaches 124mph in 7.4 seconds and 186 mph in 18.2 seconds. And according to the February 2007 issue of Road & Track Magazine, the Veyron accomplished the quarter mile in 10.2 seconds at a speed of 142.9 mph. This makes the Veyron the quickest and fastest production car in history. It also consumes more fuel than any other production car today. Founder Ettore Bugatti was born in Italy (HOLLA!). Bugatti's cars were as much works of art as they were mechanical creations, with hand turned finishes on the engine blocks, and safety wires threaded through almost every fastener in intricately laced patterns. According to Bugatti, weight was the enemy. Bugatti regarded his arch competitor Bentley's cars as "the world's fastest trucks" for focusing on durability. Ohhhhhhhhh snap! !